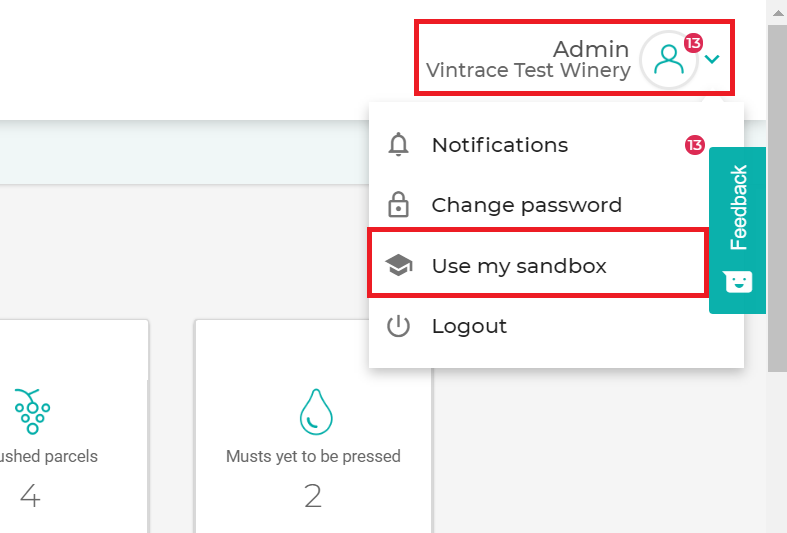 From vintrace version 8.2.1, we introduce the sandbox platform, allowing cloud customers to spin up one copy of their production vintrace instance for testing features. Sandbox instances power down after few days of inactivity and can be brought online within minutes. Data refresh timings vary from 5 to 30 minutes depending on database sizes. Follow either the Quick start instructions or Detailed instructions depending how comfortable you are with the platform. Your customer code can be found in the url of your production instance after the first forward slash or in the login window underneath Customer Code. Login to your production instance using your existing credentials. 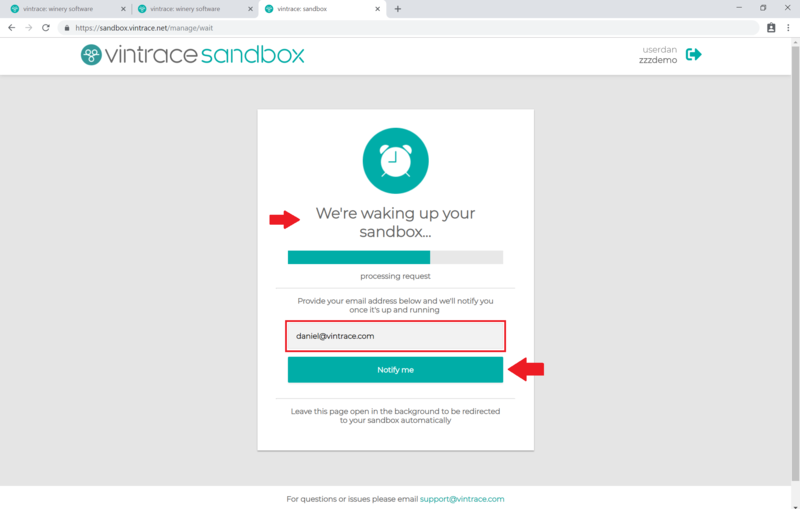 From the legacy interface click Help > Use my sandbox. 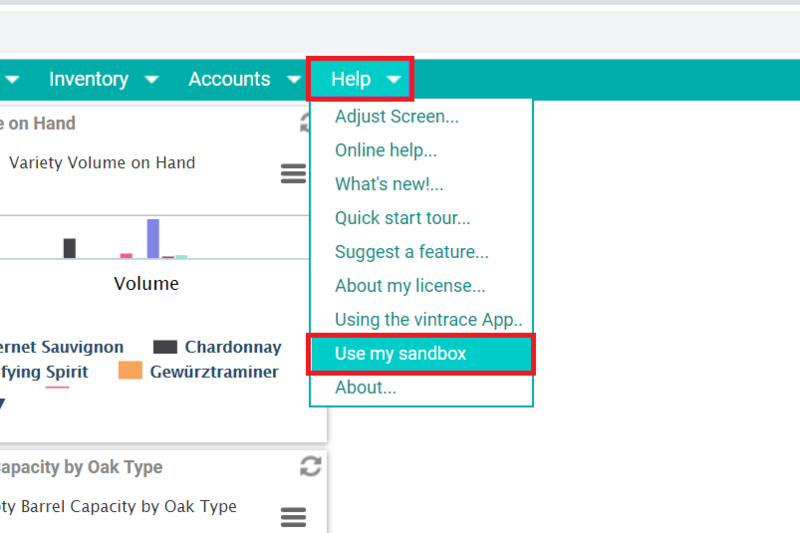 From the new/beta interface click Account dropdown > Use my Sandbox. 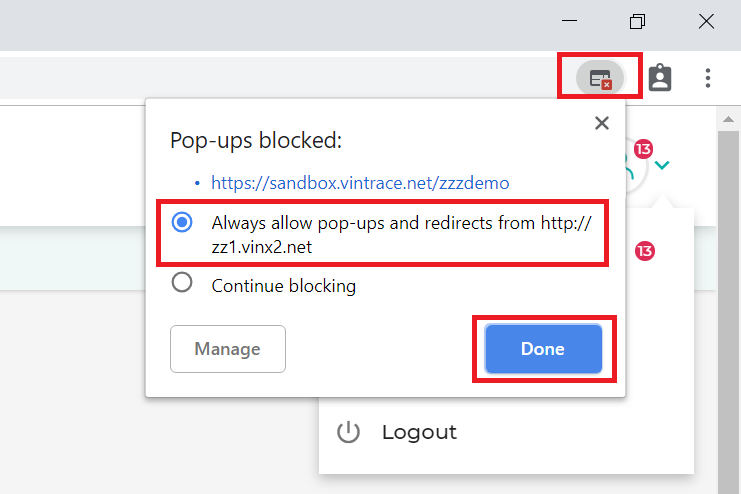 You might get a popup blocker prompt. Be sure to allow the popup. After allowing you might need to click Use my sandbox again. 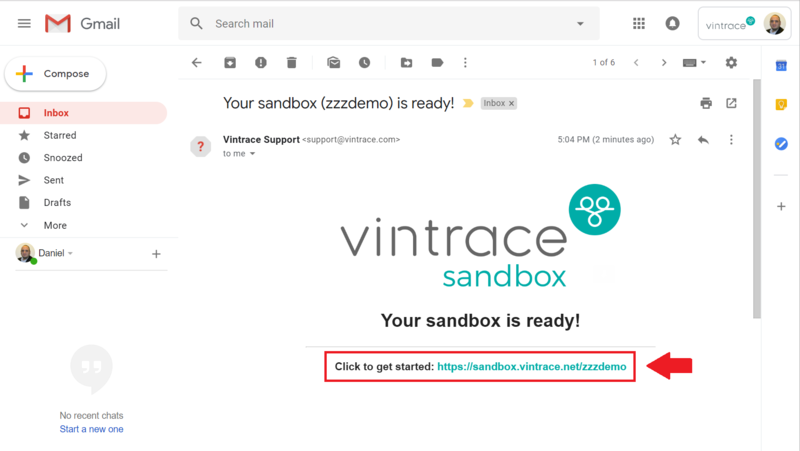 A new page is loaded with either your sandbox instance or a login prompt to start your sandbox instance. 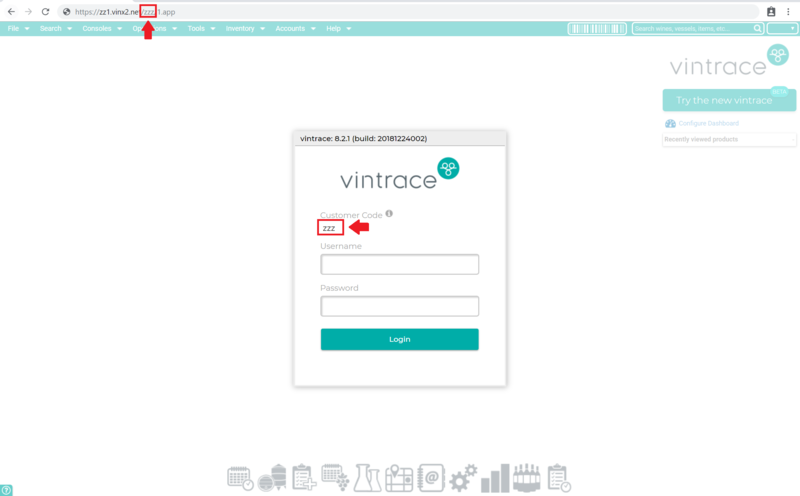 Login using your vintrace credentials. 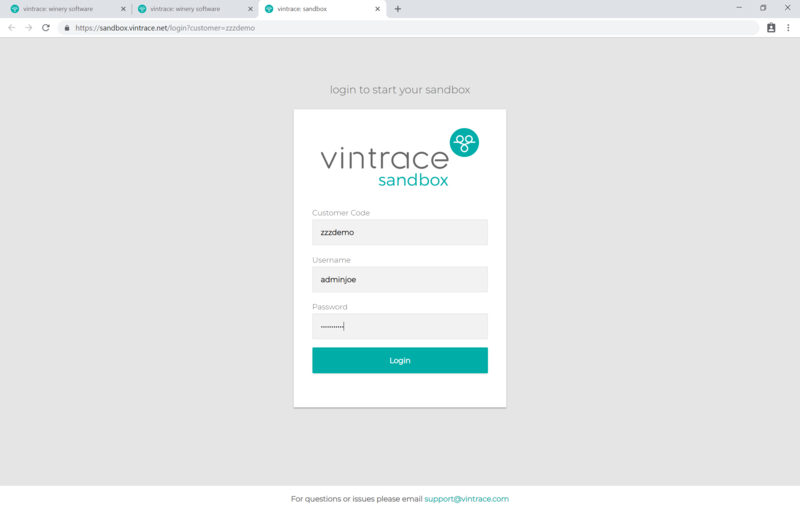 Both local vintrace administrators and normal users can login to start the sandbox. Local administrators see options to refresh, stop and start the sandbox. You can log out of the admin interface using the sign out button in the top right corner. 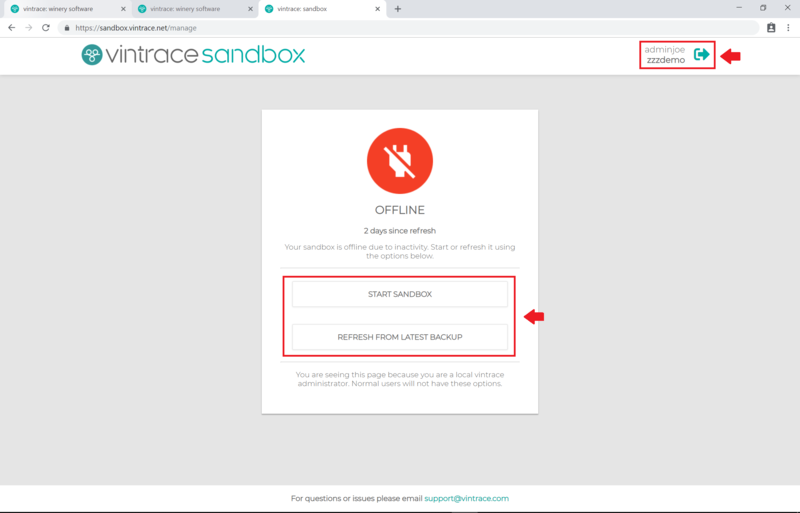 Logging in as a normal user automatically starts the sandbox (as shown in image below). A waiting screen is displayed, indicating the sandbox is getting started. While waiting, you can enter an email address and click Notify Me. Or, you can leave the waiting page in the background and be automatically redirected when the sandbox is up. Once the sandbox is up, a new page is loaded indicating the startup is complete and redirection to the sandbox automatically occurs. If you previously selected to be notified, an email from vintrace Support with a direct link is sent to the recipients mailbox. Proceed to login using the same credentials as production. 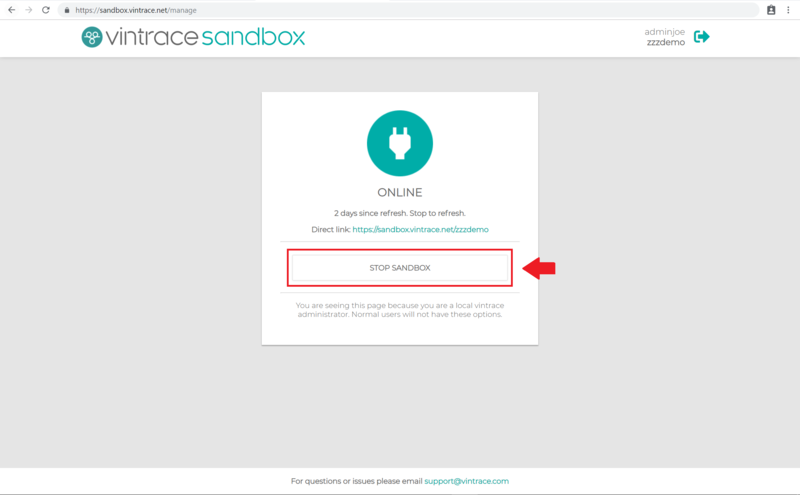 Local administrators have the option of navigating to https://sandbox.vintrace.net/manage to stop the running sandbox and refresh the data. Click STOP SANDBOX and wait for reload with more options. For any issues or feedback please email to support@vintrace.com.